The differences between ignorant and enlightened, between savage and civilized, between brute and man, are all due to mind and its action. All the multifarious customs and habits of mankind, whether simple or complex, though often attributed to other causes, are, from first to last, the direct results of thinking. Mind is the motor power and governs everything, everywhere; but man can control mind, and therefore, by that control, he may be the imperious dictator of his mind’s entire course, and, rising thence to the highest pinnacle of possibility, he may become the arbiter of destiny itself. 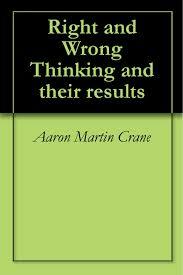 - Aaron Martin Crane, "Right and Wrong Thinking"